Today’s post is about a motivational quote which can be found across the internet falsely attributed to Mark Twain. Because it currently only appears on a handful of websites, I normally wouldn’t write about it; however, the method by which it is born is unique from all my previous posts and warrants at least a brief discussion. Twain titled the review “A Cure for the Blues” insinuating the work’s inferior style of writing will provide the reader with a laugh. Obviously, his description of it as a “great work” is sarcastic and not meant to be taken seriously. This particular misquote was probably initiated by someone who did not actually read the book and assumed all the contents were written by Twain. Oddly enough, all the websites featuring this misquote are literary in nature except for one which was a blog. One audio book website actually created a fake, distressed book cover with the title The Curious Book: A Love Story by Mark Twain. 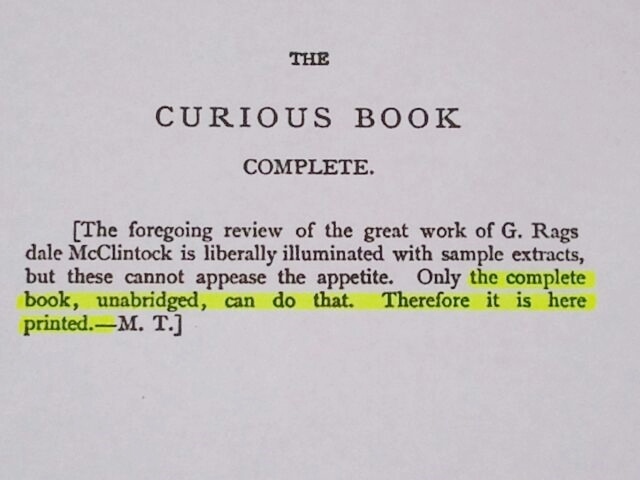 The surprising thing is that they used the title Twain used to explain why he included another author’s work (see the previous “The Curious Book Complete” image). One wonders how this could have been overlooked by people who are supposedly avid readers and book enthusiasts. Clearly no one actually read the book. What a disappointment. Although the cause of this type of misquote is not common, I have definitely encountered it more than once in my four years of research. It usually evolves from books that are collections of works by multiple authors in a particular category. For example, a book may be an anthology of English poets, and a misquote will arise due to the reader/quoter not double checking which author’s work the quote came from, and as a result William Wordsworth will be credited with words that were actually written by Elizabeth Barrett Browning or some other poet found in the collection. And, as I have discussed in all my previous posts, just one person publishing a misquote on the internet or in a book will result in propagation of it. 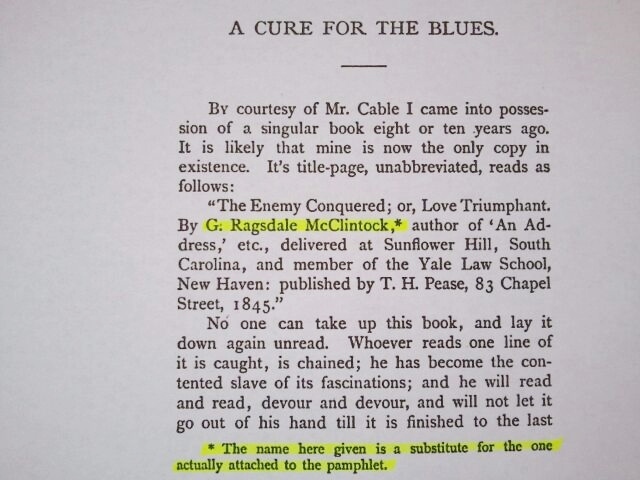 Thanks for providing the real name of G. Ragsdale McClintock. I just finished reading Twain’s review and the incredible “The Enemy Conquered” while proofreading them for Project Gutenberg. If you have read “The Enemy …”, you will understand how difficult it is to proofread for just the reasons Twain describes in “A Cure for the Blues”. 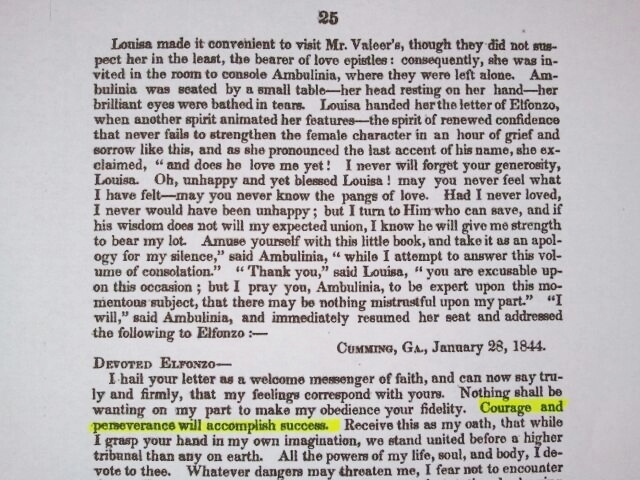 The proofreading is a labor of my love for Twain (and Project Gutenberg). Thank you for acknowledging my article. It’s always nice to get positive feedback, and I really appreciate it. Also, kudos to you for contributing to Project Gutenberg! I use it all the time and think it provides a an important literary service to the world. Keep up the great work! Thank you so much for this post! 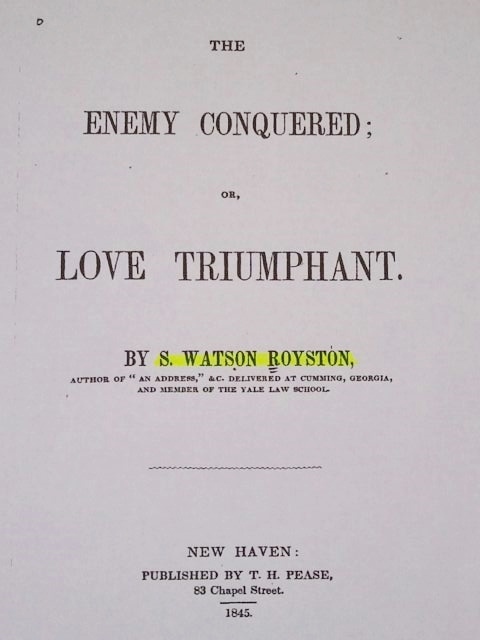 Samuel Watson Royston was my Great Great Great Grandfather, and I was confused for a few minutes why Mark Twain was listed as the author of his book (lol). He died in 1879, so it looks like he never had to witness Twain’s roasting. My understanding is that after Yale, he decided to become a farmer. Hi Louis! Well, I’m glad to hear that dear Mr. Royston was not around to experience Twain’s roasting. Ouch! Hopefully, he had much success as a farmer. Thanks for the comment!